The damage done by slugs and snails is all too familiar to most gardeners especially to the soft young growth and tender shoots of a wide variety of vegetables and ornamental plants. 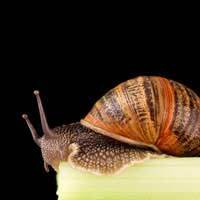 Unfortunately, the British climate seems to favour these pests; our warm, wet winters and relatively cool, damp summers allow snails and slugs to remain feeding – and breeding – for much of the year. It is little wonder that they are such a persistent problem – but there are ways to combat them. It is unlikely that any one single method will give complete success against these pests, but a combined approach using a few of the available methods should give your plants a decent chance of survival. A variety of materials have traditionally been used with varying degrees of success to physically stop slugs and snails from reaching their food, including coarse sand, sharp gravel and crushed eggshells. The idea is that they find travelling over these surfaces difficult or unpleasant, but often with the passage of time the barriers settle or smooth off, reducing their usefulness, so it is probably a good idea to keep them topped up. Vulnerable plants can also be protected with cloches – very effective temporary ones can be improvised from plastic bottles. Another option is the Slug Ring, a pure copper collar which is slipped over the plant to be protected and pushed slightly into the soil. Sold commercially, it seems to have been very successful in deterring the hungry pests, though obviously a ring is needed for each individual plant. Some gardeners have found that rings of cereal – especially bran – can be used in a similar way. Rather than repelling the slugs and snails, it offers them an alternative foodstuff, which they seem to find irresistible, feasting on this and largely ignoring the garden greenery. That old gardeners’ standby – the beer trap – works on much the same principle, luring the slugs to their alcoholic doom at the bottom of a jam jar sunk into the soil. It has often been jokingly said that there is no such thing as too many slugs, only too few hedgehogs and there is a vein of truth in the humour. Slugs and snails do have a large number of natural enemies and encouraging these helpful creatures to take up residence provides the garden with a free and very effective round-the-clock pest control service, with the added bonus of being 100 per cent pesticide-free. This does not have to be a huge undertaking. Building even a small pond can help attract frogs and toads, simply providing flat, cat-free areas within the garden will appeal to thrushes, blackbirds and other ground feeding birds and a few suitable sheltering places will encourage hedgehogs. Recently another form of biological control has gone on sale which uses a small nematode worm which rejoices in a scientific label far longer than the creature itself – Phasmarhabditis hermaphrodita. The nematodes are watered into the soil, subsequently entering slugs’ bodies and infecting them with a fatal disease which only affects slugs. Although it is not the cheapest method of slug control, it has proved very effective. This method is mainly of use between spring and early autumn, when weather conditions are best for the worms. Its most obvious advantage is that it is quite harmless to anything other than slugs, so other garden inhabitants will not be affected – though, clearly, it will still leave you needing another method to keep the snails down. The numbers involved are, however, staggering – some 12 million nematodes are supplied as a dose to treat up to 40 square metres of soil! Garden centres arguably make more money selling slug pellets than any other pesticide. The pellets themselves are poisoned bait – pieces of cereal, soaked in metaldehyde or methiocarb – which must be spread thinly to be effective, since a concentrated heap actually repels the intended victims, sending them off to eat your unprotected plants! Although they are certainly effective, the use of slug pellets is not without its problems, particularly if there are small children or pets to consider and, in addition, the predators which naturally help keep these pests at bay can also be harmed if they pick up poisoned prey. Various alternatives exist to traditional pellets, which are based on aluminium sulphate or a newer and even less harmful iron phosphate product. While such persistent pests will almost certainly never be completely vanquished, applying some of the methods outlined here should at least ensure that their numbers do not get out of hand.